Early pregnancy is the period when the foundations are laid for the baby's health. The lack of vitamins and minerals in the pregnant woman's body can cause problems with child development. If conception occurred in summer or autumn, vitamin deficiency expectant mother is not threatened, and at other times of the year the lack of nutrients need to be supplemented by taking a vitamin-mineral complexes. Vitamin B9 also known as folic acid, is one of the most important substances in the early stages of pregnancy. The first few weeks after conception is the formation of the neural tube of the fetus, which determines the subsequent development of the child. A lack of folic acid leads to birth defects, e.g., spinal hernia or hypoplasia of the brain. This vitamin not only contributes to the proper formation of the fetus, but also improves the health of the pregnant woman. It is advisable to take folic acid even before pregnancy, but if you weren't planning on conceiving, it can be done on the first day, he learned about their situation, and until the twelfth week. In day it is necessary to take four hundred micrograms of vitamin. Folic acid is sold in pharmacies in the form of tablets. Vitamins it is desirable to support appropriate diet: folic acid is found in green vegetables, cauliflower, potatoes, beans, citrus fruit, milk. In the early stages of pregnancy is useful to take vitamin a, but the dose should not exceed 1300 micrograms. This ingredient supports cell division and differentiation in tissues and organs, it contributes to the development of the skeleton, nervous system and visual apparatus. But its overdose can lead to abnormal development of the child, to cause malformations of the heart and pathology of the nervous system, affect the appetite and health of the pregnant woman. Vitamin E is involved in the production of female hormones before birth, increasing the likelihood of pregnancy but in early pregnancy it is also important, as is responsible for protection against miscarriage. Also with the help of this substance is formed in the placenta. 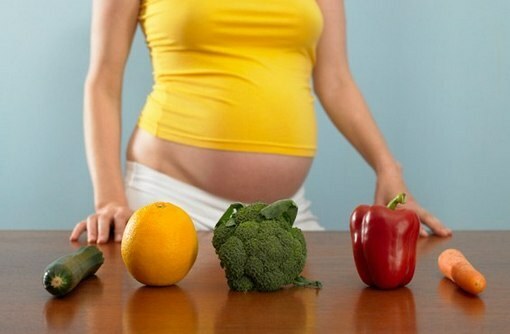 Vitamins A and E need to continue until the end of the first trimester. Pregnant women are much easier to take a good multivitamin complexes, which have all the necessary vitamins for a child's development in the early stages of pregnancy. In addition, for the formation of the fruit have sufficient quantity of minerals – iodine, calcium, iron. Thanks to these minerals and vitamins are well absorbed in the body. In multivitamins for pregnant women all these elements are contained in the right quantity. It is especially important to take vitamins, if a woman has a gynecological or other diseases, such as hyperbilirubinemia or cardenales. Choosing a multivitamin preparation, please note that it was intended for the first trimester – in this case, it will be a sufficient amount of folic acid, dose of vitamin A is not exceeded. The most popular vitamins for pregnant women is "Abusive", "Elevit", "Pregnavit", "supradin", "Vitrum Prenatal".